When I look back at the books I have read over the last year, there has been a pretty clear shift from the romances that I used to read, almost to the exclusion of everything else, to my rather diverse reading fare, a lot of while you see mentioned on my blog. 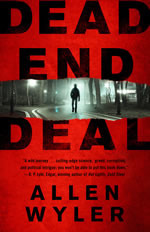 If the publisher of Dead End Deal had asked me a year ago, I probably would not have agreed to review it and that would have been a mistake. I was immediately draw into the story of Jon Ritter who is a neuro-surgeon working towards a cure for Alzheimer’s, as well as other forms of dementia through the use of stem cells. Having following the various controversies regarding stem cell research over the last few years, I realized that I really knew nothing about it, and so entering the world created by Allen Wyler, I was immediately sucked in. As I was reading, my first through was wow, he sure knows a lot about neurosurgery and upon googling his name, I found out why, he is a Doctor in his own right. The book brought up some interesting ideas about the use of stem cells, how pharmaceutical companies influence funding towards drugs, and what would happen if a cure was really discovered but (and this is me thinking out loud) what if the cure was never published, never mentioned, so that these companies would still keep getting money to fund their research. The novel was well-paced, and while I was able to see some of the twists coming before they did, there were others that I didn’t see, which increased my enjoyment of it. Overall, I’d give it 3.5 stars, but I will definately be seeking out this author again in the future.